My spree pretty much started because of these shorts. I mean, they look so perfect on the model! But I never fit well into F21's shorts or pants unless they had an elastic waist. For $14.80, I decided to give it a try. I can't seem to find any cheap distressed high waist shorts in my size anyway. The really pretty ones that would definitely fit me are in the thirties range. I might invest in a pair or two in future, but not at the moment. The button and zip feel really cheap and I read in the reviews that it broke off for one girl. Otherwise, sthe material is not that bad, reasonable and it looks cute, though the colour is darker than in the photo. The smallest size still turned out to be too big for me everywhere, from the waist to the thighs. I seriously do not know how it looks so good on the model. Even my thighs are too skinny for the shorts. I give up.. If you come across any cheap denim high waist shorts with a waist size of 11-12" across / 22-24", please let me know immediately! These shorts are very versatile and easy to style. You can seriously match them with anything. I paired them with an aztec caged top I got recently too and a sweater from lightinthebox when it gets chilly. I got to say, I kinda forgot I ordered this until I saw my items. Must have been really long or it felt like it. It's super cute with the lace details and very stretchy. It's a tiny bit big on me at the bust but otherwise, it's fits perfectly. I paired it with a strappy bralette inside because the neckline is a little low. Perfect chance to show off the strap design. I also paired it with a black skater skirt, which doesn't really bring out the lace design unfortunately. 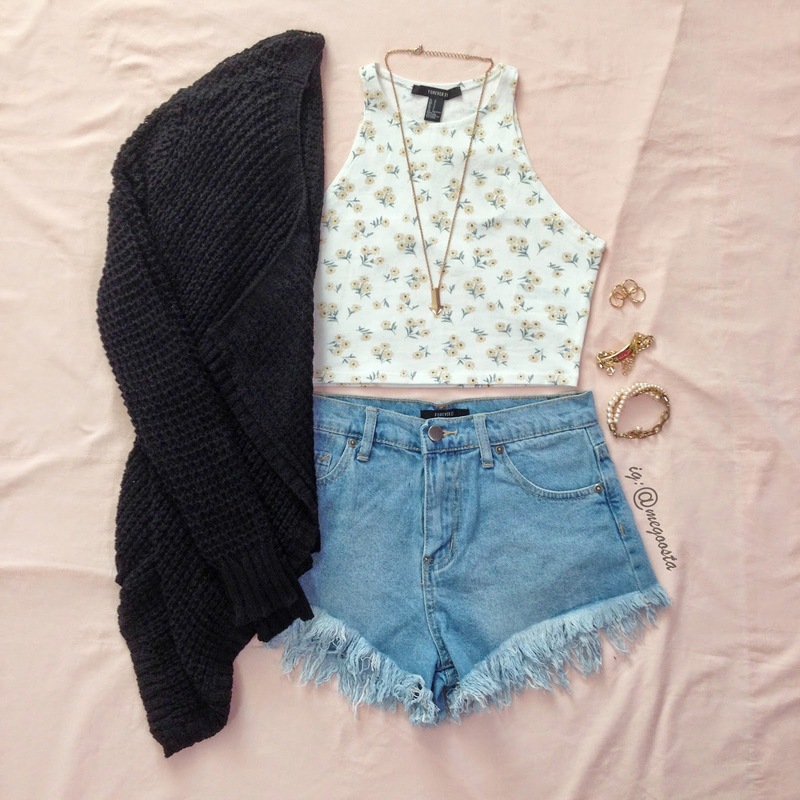 Big love for this crop top! I've always loved cut in shoulders so this is super cute. I had wanted the one in black but they ran out of small sizes so I got the white one. It turned out to be super pretty too. The neck hole is truly small though, so it is quite hard to fit your head through it and you gotta be careful. Otherwise, it is rather stretchy elsewhere. The cutting doesn't fit my small bust very nicely though. It's not that bad but I remember trying on the floral Shameless crop top and I couldn't get it because the cutting was just not good. In fact, many of F21's cut in crop tops are not suitable for me because of the cutting. So, I'm super happy that these are still wearable. Paired these with my denim frayed shorts, and a black cardi from wetseal that I got with my HSG shipment. They were on 70% sale so I just couldn't resist! Got this spaghetti strap crop tops in grey and mint because they were only 1.80 each. They were also the only colours left in small so I just snagged them. The material is quite soft and stretchy, so it is definitely worth the price. It's a tad translucent though and the neckline can get quite low, so it's also a good chance to wear strappy bralettes! Finally, got these tonal sports bras in pink and coral because they were on bogo sale. Also, I own two other of their layering bras and they are the most comfortable things on earth. 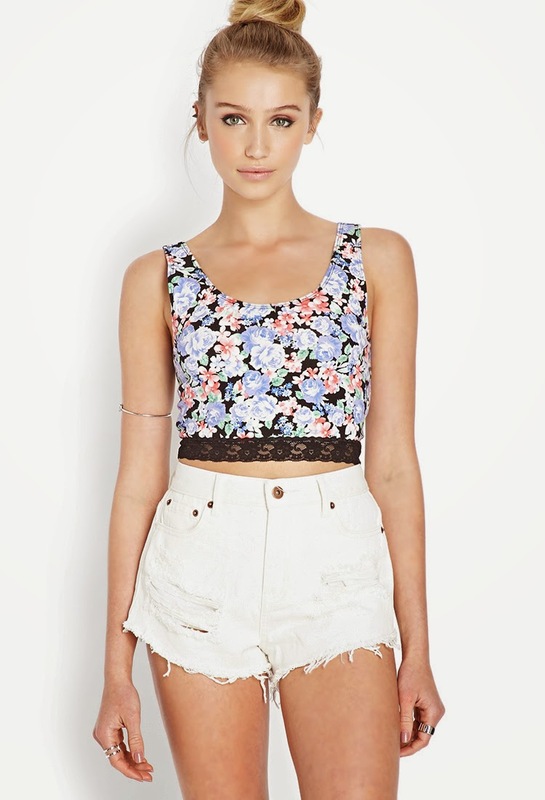 F21 actually has a few variations of this but they seem to be mostly the same to me. The padding on these are just bigger and stiffer. Otherwise, it is still as comfortable and stretchy. I'll be wearing these to replace my normal bras as much as possible. Comfort first. The only disappointing thing about this is that the colours turned out to be much brighter, and almost neon. Totally not like what the picture shows. Before HSG, I bought some f21 stuff from a spree organiser, which is basically someone who collates orders from many people before placing the order. I bought a couple of caged bralettes and a backless dress and it finally arrived in the mail after a long long wait! Caged bralettes are all the rage this season but it's so hard to find any here so these were a perfect pick. Plus, the price is reasonable and a great alternative to brandy melville or some other stores. The designs are cute too. It fits nicely, but it is unpadded so you're going to have to attach some pads somehow or just go with a bra inside. The back strap would still be covered a little by the caged back. The material is definitely thicker than it looks and so worth it. And now, they make cute little twin outfits! The caged tops would definitely go well with this backless dress too. Again, they are so hard to find here except in Forever 21 but f21 sells them for $29 here. I'm actually quite surprised they haven't sold out yet. In fact, there is a huge rack of these dresses at their stores. I might pick up the blue one if they haven't sold out in smalls yet. This dress has got a textured feel and may be a bit translucent, so it's better to have some safety shorts on. It goes great with a cardigan too and the shape is just pretty and complements shapes! Styled it with the wildflower caged bralette and a white cardigan from wetseal!